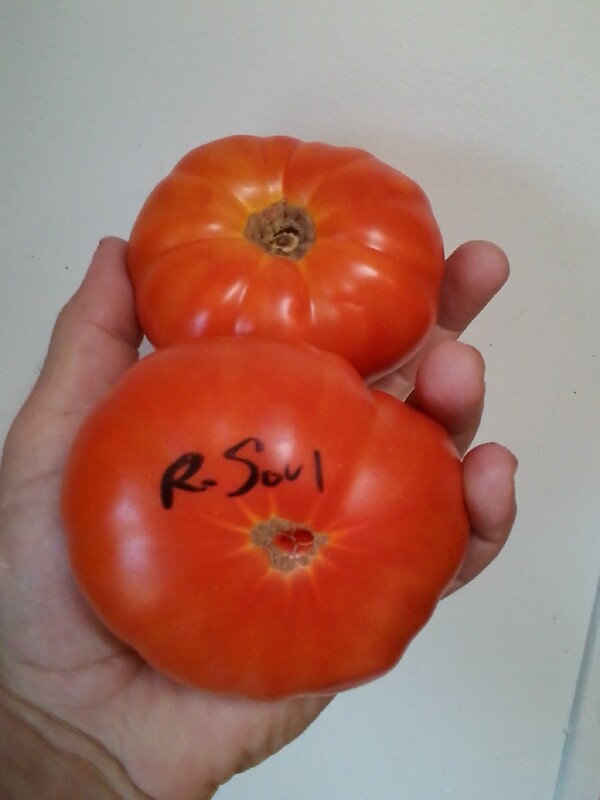 A great ripe at once trait that many of the plants have, I hope this shows the potential as a market tomato, besides the awesome taste. My lord aren't those awesome. Impressive indeed sir! Bradley and Rebel Yell are also both excellent, as far as flavor goes. The Russian Soul has been sitting on my counter for a week. It's still in good shape. I had a feeling anything with shelf life that good wouldn't be my favorite to eat. And it's not. But it's not bad. I would rank it a notch below Tarasenko-6. But I still think it is better than any tomato being sold anywhere near me at the moment. I don't mention this to market customers, because I don't want to bad mouth my fellow vendors, but I would prefer to eat the Arkansas tomatoes that are in local grocery stores right now to anything being sold at any farmer's market near me. Vendors grow ultra-firm hybrids like Sunbrite. I don't like firm tomatoes. But I was wrong, thankfully. I actually like it quite a bit. Beneath the firmness, there is quite a bit of juice. Flavor is sweet, and the flesh is not grainy at all. It's not as early or high-yielding as Taxi, but beats Taxi hands-down in regard to flavor. I also tried the Shadow Boxing that I posted a pic of earlier. 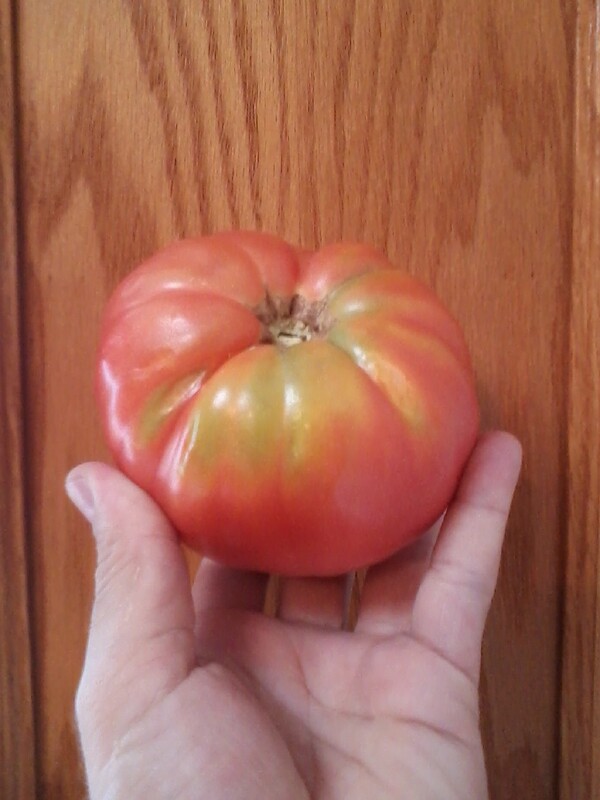 Last year, I grew it in a container, and I think I was eating them before they were fully ripe. The insides will turn a deep red when ripe. The ones I just tried were very good. They had a "real red tomato" type of flavor. Last edited by Cole_Robbie; June 24, 2016 at 03:58 PM. Looks interesting, how would you compare production with Taxi? I've only got one plant growing. It is as productive as anything else I have in the high tunnel, more so than a lot of them. Nothing is going to match Taxi in production. But if this one yielded half what Taxi does, I would still grow it. I am really liking Taxi, so thanks again for that tip. I am hoping Mat-Su Express will be my new red mini-tunnel variety. I'd like to do a mini-tunnel of each next year. I just tried a Grot. It's a medium/saladette red. It felt like a rock. It sat on my counter in 90 degree weather for two weeks, and still wouldn't turn soft or go bad. Once again, I thought I would hate it, but it was actually really good. The two new varieties I tasted today are the first two firm varieties that I have ever liked. The Sweet Doughnut sounds interesting. Where did you get your seed? Zarca is very similar to Grot. I think it's even more firm. It's been on my counter for three weeks in hot weather and no air conditioning in the kitchen. It absolutely refuses to go bad. It's been in marketable condition the entire time. Like Grot, I thought it would be awful, but it is actually quite good. 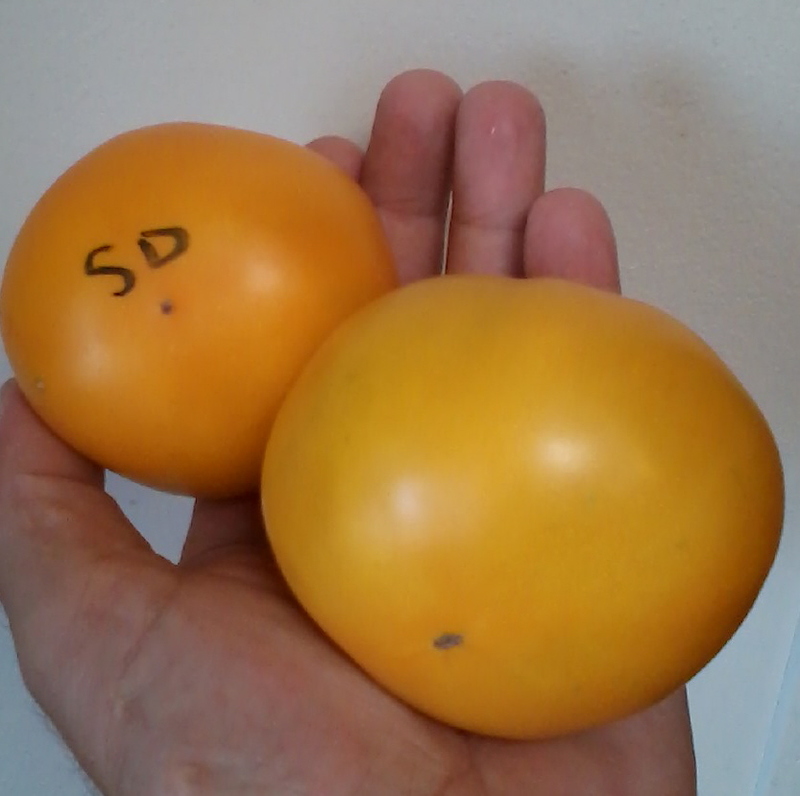 These firm tomatoes are firm because the outside fleshy wall of the tomato is thick, but the internal juice and seed cavities are quite large and full of sweet juice. So they manage to be firm and juicy at the same time, which I did not know was possible. I saved a few seeds from Titan Red. Despite being one of my favorites from last year, it got out-performed by its competition this year. Tarasenko-6 has out-performed Cosmonaut Volkov quite handily. It will be my main indeterminate red for next year. I'd say Tarasenko 6 is 9/10ths the flavor of Cosmonaut and double the production. Honestly, I don't keep track. It was a swap of some sort. I swapped with a lot of people on here, and also a few non-tvillers, so there's no telling. To finish up my reviews of the high tunnel varieties, I just tried both a Rebel Yell and a 'Great Warrior.' Rebel Yell beats it like a drum. There's no comparison. I saved a lot of RY seeds. So what is your opinion on Great Warrior? It is a new one to me. Pretty early and substantial in size even in my shady corner. But still green. 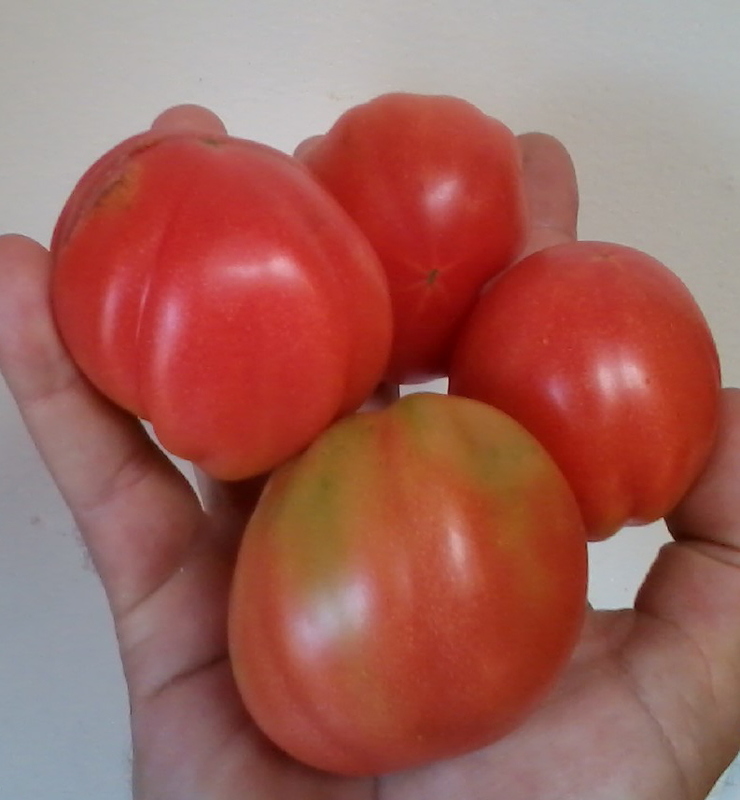 Good plant, very productive, huge tomatoes, ripened last of the high tunnel varieties, decent shelf life. Flavor isn't awful, but it just doesn't do much for me. I like Anna Maria's Heart better. I like Rebel Yell much better. RY & Mat-Su Express are just so outstanding, any variety growing next to them is going to look bad by comparison. Great Warrior's flavor can be compared to Tarasenko-6. It's good, but not great. I really liked Zarca. It's a versatile little tomato and the productivity is obscene. Flavor is quite good. More plants on the way. This is as close to Grot as i get this year.